Streaming is the bandwagon to be on in 2011. Any electronics manufacturer worth its salt has realised as much and many are already fighting for a slice of what is considered to be the future of audio. Cyrus has jumped in with three new streaming-compatible products that compete head-on with the leaders in the field, each contained within the iconic half-width Cyrus case and bursting with features. The Streamline is the integrated solution with onboard amplification, the Stream X strips things right back to pure streaming functionality, while the Stream XP we have reviewed here combines that with a high-quality preamp and DAC. 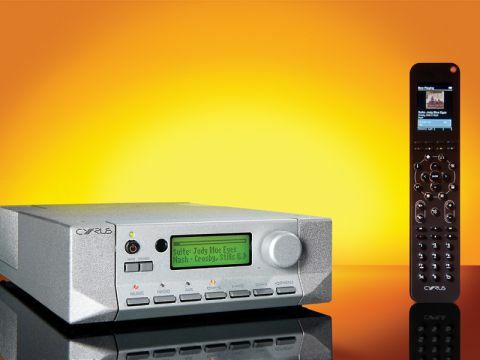 These three products are built around the Stream X core, which can stream wired or wirelessly, has USB and digital inputs, offers TuneIn net radio and is designed to be driven with the rather clever Cyrus n-remote. They will stream most of the worthwhile music formats, the only notable exception being Apple Lossless, which could be an issue for iTunes enthusiasts. iPod users, however, are catered for with a digital USB input. The same input will also stream from a USB drive and the maximum bit rate for streamed inputs is 24-bit/96kHz. To this roster, the Stream XP adds twin Burr-Brown DACs, a preamplifier with fixed and variable outputs on RCA phonos and a headphone output on a mini-jack socket. It's also the only model in the range that will accept the worthwhile Cyrus PSX-R power supply upgrade. It's this latter feature that marks the XP out as the component with the greatest audiophile potential; without it you would be forgiven for thinking that the Stream X looks like the way to go for maximum resolution. Cyrus chose to offer the Stream X for customers who already had a decent preamplifier and DAC, which is fair enough. The key to all three units is the incredible n-remote. This not only drives any other component in a Cyrus system (and third-party components, to boot, as it's a learning device), but has two-way comms, so it can display all the pertinent information about the music in your 'library'. The n-stream is a pretty ambitious remote for a medium-sized company: it's both IR and RF; has a colour screen and a motion sensor to turn it on; backlit keys and a charging base. So, in many respects, it's a universal remote that specialises in giving access to your digital music collection. The company's preferred suggestion for music storage is a wired NAS drive, but rather than simply connecting the drive to your router and then wiring that to the Stream XP, Cyrus encourages the use of a switch in between. These inexpensive devices are usually used to expand the number of ports on a router, but Cyrus has found that they provide faster and more reliable streaming between the drive and player. As well as streaming stored music, the device can also bring you any station or podcast on the TuneIn net radio service. This offers 30,000 stations from around the world that you can save in presets using the n-remote. Usefully, chosen stations can be synced across multiple devices, so that you can find them on your smart phone as well. The total absence of analogue inputs on this product is unusual and rather undermines the unit's potential for vinyl users, for instance, but as it's a totally digital product up until the output stage, adding them would have increased cost. Cyrus also thinks that analogue inputs would go largely unused by its customers and as the company doesn't currently make a standalone phono stage, it probably has a point. This Stream XP is built as per all the company's product; in a die-cast case that, while not the shiniest in the land is, for audio purposes, extremely well thought-out. It provides high-resistance to vibration and more than adequate heat-sinking on a compact half-width footprint and, as Cyrus has pointed out in the past, because of the initial outlay die-cast chassis are pretty rare in this market. The value equation is greatly enhanced by the n-remote. Look at the competition in this sector and you won't find a handset that comes near it in terms of breadth of application and ease of access to your music collection. Having used the Naim UnitiQute with its basic IR remote, we can immediately appreciate the advantage of having a two-way link that puts all the information about the music in your hand. Competitors offer apps for smart phones and Apple touch screens, but these can't drive IR components and, in our experience, tend to drain batteries when used for this purpose. There is a growing array of competition for serious streamers and Linn's Majik DS at £1,880 has to be a key player. In spec terms, it lacks inputs of any flavour and has no facility for wireless operation. It does have volume control and accepts digital streams up to 24-bit/192kHz, so undoubtedly competes in sound quality terms, as would a Naim NDX, but that is an extra £1,000 and has fewer digital inputs. But it does do wireless (though not advised) and can also be upgraded with a power supply. A product like the Stream XP is as much about ease of set up and use, as it is about sound quality and Cyrus appreciates this. The company provides a quick start-up guide for setting up the NAS drive with the player and pairing the n-remote. Both procedures are straightforward and we had the XP up and running in five minutes (wiring up the NAS drive and switch had been done beforehand). It's when you come to search for the albums and tracks on the drive that issues can crop up; the most likely one is that files ripped as WAV and AIFF do not maintain their metadata. This makes them hard to find in the library, because album and artist info gets lost. Cyrus recommends ripping everything as uncompressed FLAC, because this format has the greatest portability. It's also the format that most hi-res downloads come in as well. The n-remote's buttons are a little stiff and scrolling through the library is a bit jumpy, but it's significantly faster than using Apple's Remote interface for instance. The album artwork could also be bigger, but it's a clear display that is intuitive and easy to read. We like TuneIn radio, and its online interface RadioTime, and this proved easy to set up and quick to find stations with. It would be useful to be able to store presets from the handset, as this is what you have when exploring stations, but in other respects it's a good system. We used the XP in the prescribed fashion, with a Twonky Media-equipped NAS drive and network switch wired direct (wireless was tried, but even with the router in the next room there was drop-out). Few systems are reliable without a cable. The sound quality produced is impressive for a streamer. It's not in the front league, but there are few streamer/DAC/preamps in this price range for comparison and we found the results very good indeed. The bass is not the most weighty, but is never short on agility; sinuous bass guitar playing is very easy to enjoy as are great voices, thanks to a little added richness which helps to flesh things out. It's not the most transparent midband in the business but voices do work well, revealing plenty of ambience and emotional intent. If you are after a hard-hitting sound, then there are more expensive alternatives, but those who want to relax with their music will find much to enjoy here. As a digital preamp using an S/PDIF input, the character is a little more open and clear-cut (than streaming), but not dramatically so. We recalled that Cyrus likes DNM single-core cables, so tried an interconnect with the XP. This tilts the balance upward and gives a bit more bite to leading edges, which helps with dynamics. The Stream XP is a remarkably flexible and capable piece of kit that's allied to a very impressive remote handset. Not having to point the thing in the right direction is a luxury in itself! As an overall streaming package, the Cyrus approach is commendably straightforward to set up and use. The standard of sound quality is high and, while not quite up with pricier rivals, there is no alternative that offers so many features and this puts it in a class of its own.